You love trying out different spices and condiments. But then, you love some and you don’t prefer some. There is no shame in accepting the fact that you are loyal to some product. Since time immemorial, i.e. from ever since I could remember, I have seen my Mom cook up sumptuous Kerala delicacies in her kitchen using this particular brand of spices. Be it the Chicken Curry Powder, Rasam Powder or the plain old Turmeric Powder, this brand has never let her down. I am talking about the popular Eastern Spices and Condiments. I have followed my Mom’s path ever since I started cooking. The very first time I cooked Sambar for my husband will be engraved in my heart forever. I had followed Mom’s recipe to the T using Eastern Brahmin Sambar Powder and believe me when I say, my husband was bowled over. I will not be exaggerating a bit when I say there was close to nothing left in that 5-litre pressure cooker after lunch. And then, I knew that I could cook. My kitchen reserves a special place for all my favorite Eastern Spices. When I was given the opportunity to review about a dozen of their products, I was elated- for it was not just a chance but the heart was involved. My Dad has a knack of cooking non-vegetarian dishes. He loves the Chilly Chicken Masala from Eastern. Their latest addition is the Fish Fry Masala. During her visit to Kerala, my Sister-in-Law had purchased bulk loads of it to the United States. She had suggested me to try it out for that authentic taste and yes, the fried fish had turned out real good. I prepared the Chole Masala as per the instructions on the packet. It was okay. I think you should add the Eastern Chole Masala powder to the regular Chole Curry you prepare at home and it would turn out much better. It has been a while since I’ve been to Kerala and I didn’t know about their 3 Step Cooking Ready mixes. I was astound to find Palak Paneer Masala, Veg Kadai Masala and Methi Mutter Malai Masala in the package that they had sent across and I wanted to try them out soon. Each of these products has a detailed recipe behind the packet and it is easy to follow. The packet is made of high quality paper and the flavor lock method retains the aroma and essence of the spice mix for up to nine months. 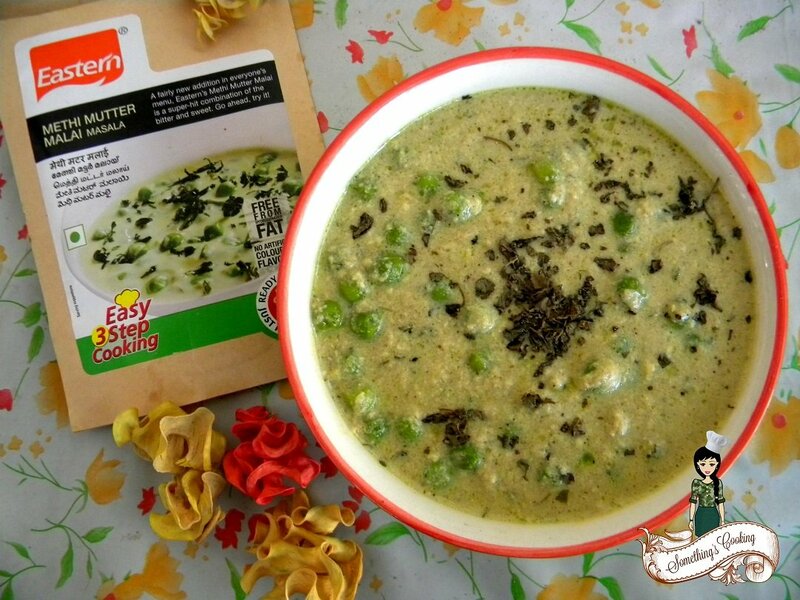 I tried the Methi Mutter Malai Masala and it was a piece of cake. As in the instructions, I mixed the whole pack of masala in two cups of milk and cooked the green peas in it until the gravy was thick. It served as a perfect side dish to both roti and rice. The spices are well balanced and it was easier to prepare amongst the three ready mixes. The gravy was creamy and luscious and the aroma of Kasoori Methi was tempting. The dish was a huge hit in my family. 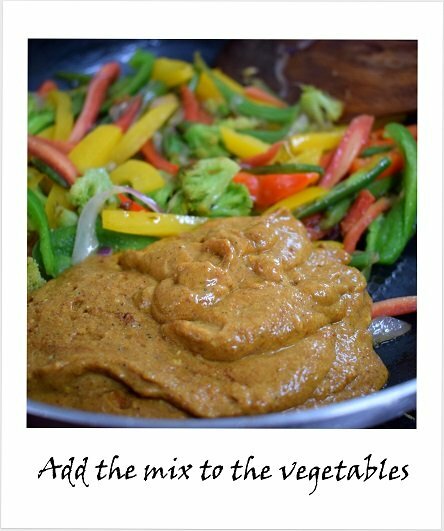 Here’s how I tried their Veg Kadai Masala. I have used carrot, capsicums, broccoli and paneer for preparing this dish. You can also add potatoes, green peas and cauli flower. 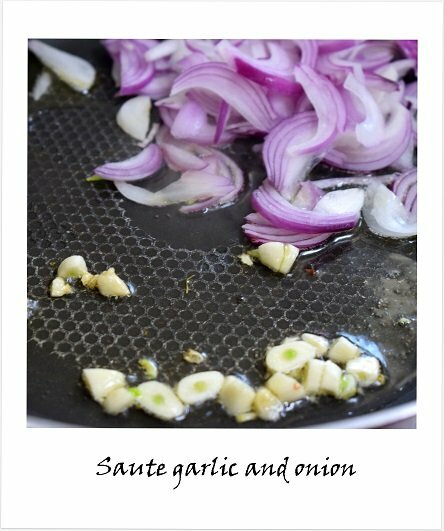 Heat oil in a pan and add sliced onion. Saute till soft. Though the spice mix contains garlic, I love the added flavour. 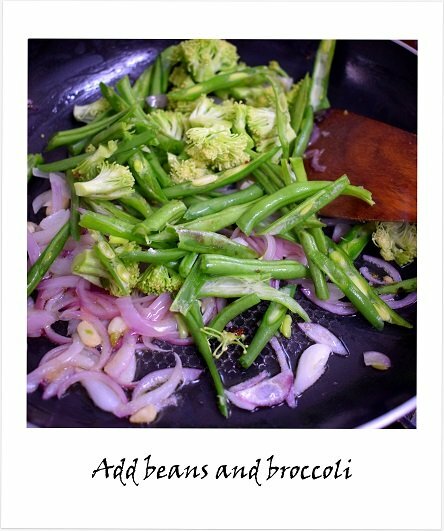 Since beans and broccoli has longer cooking time, I have added them first. Saute well. Add rest of the vegetables and saute till it is half-cooked. 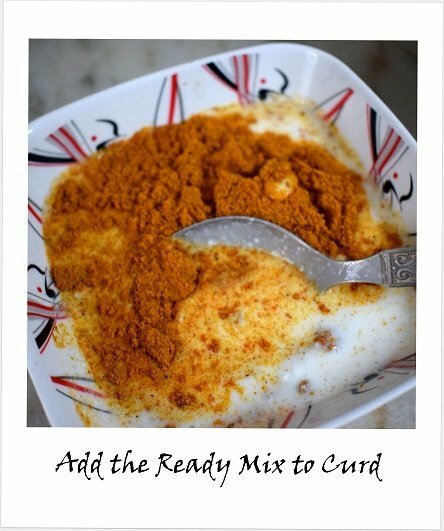 Mix the entire content of the packet with half cup of curd. Mix well to form a paste, devoid of lumps. 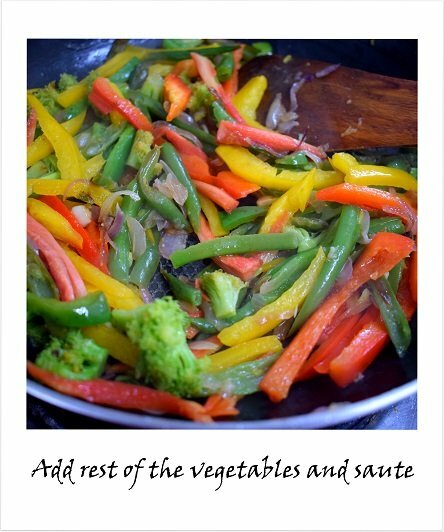 Add the mixture to the vegetables along with a cup of water and mix well. Cook covered for about five minutes in medium heat. Add fried paneer cubes and cook for a couple of minutes more. Eastern Veg Kadai Masala is ready. The dish was palatable except for the mild dominance of the spice mix. I loved the regular Eastern Condiments than the Ready mixes with the exception of Methi Mutter Malai. The prices are reasonable ranging from INR 10 to INR 50. The ready mixes are priced at INR 40 per pack. Eastern Condiments are free from hydrogenated fat and artificial colors and flavors. 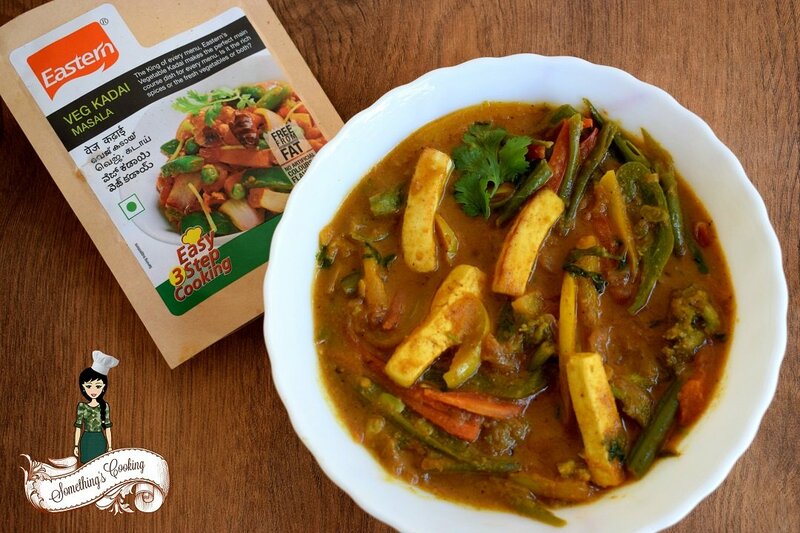 It is no longer limited to South Indian cuisine and the ready mixes is an excellent option to whip up some delicious curries in limited time. The products are widely available and you can also purchase it online. 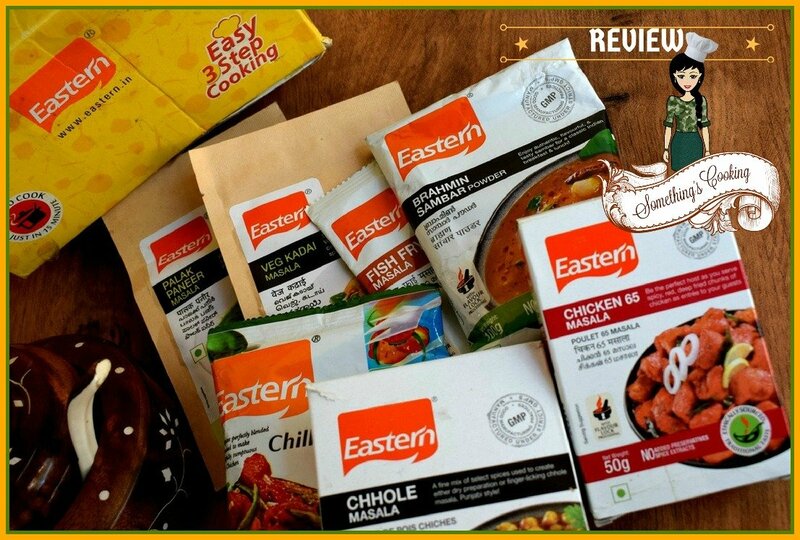 Thanks Eastern Condiments for giving me an opportunity to review the products. Disclaimer: I have received the products in return for my honest review. I did not receive any monetary compensation for the same. The post has been written from the heart, Shalini. I can very well see that. 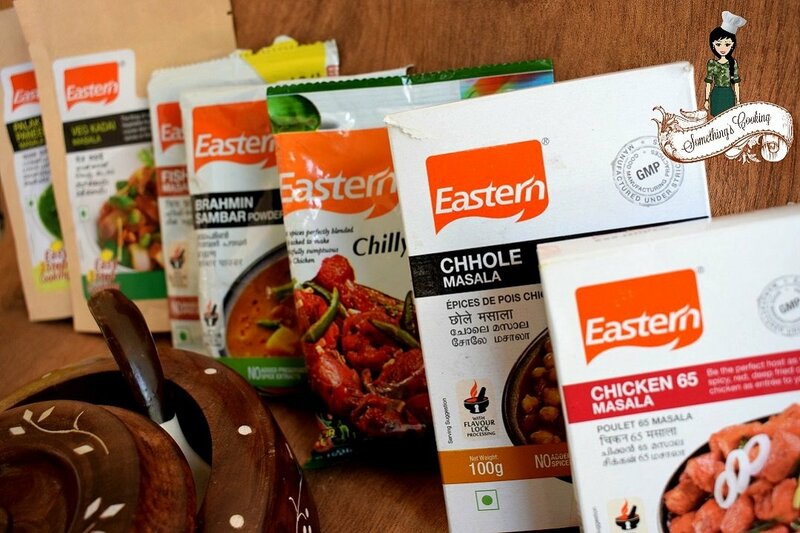 Eastern is a product we have been using since I could remember! I love Eastern Masalas – discovered them on one of my many trips to Kerala. Their instant rasam is great too. I’m glad you shared this, I can get all the masalas in Hyderabad at our local ‘Kerala’ store. My mom loves Eastern masalas too! I love the sambhar and the chicken curry that she makes using the Eastern masalas. I am sure when I actually start to cook regularly these masalas will be definitely helpful! Awesome collection of spices. Have you inspired the logo of blog from Dewcool. Thanks. And I have my logo since ages! I don’t like spice mixes because of their overpowering flavours Will check out Eastern spice mix. Thanks, Amrita. I hope you like them. Wow. You’ve tried so many of them. The vegetable kadhai looks delicious. Methi Matar Mali is another one of my favourites. Will look out for this masala. Thanks, Tulika. I hope you like them. Eastern masalas are a favourite for us too. But I had never tried the north indian masalas they have. Now should try it out. That Methi Malai Masala is looking just too tempting. 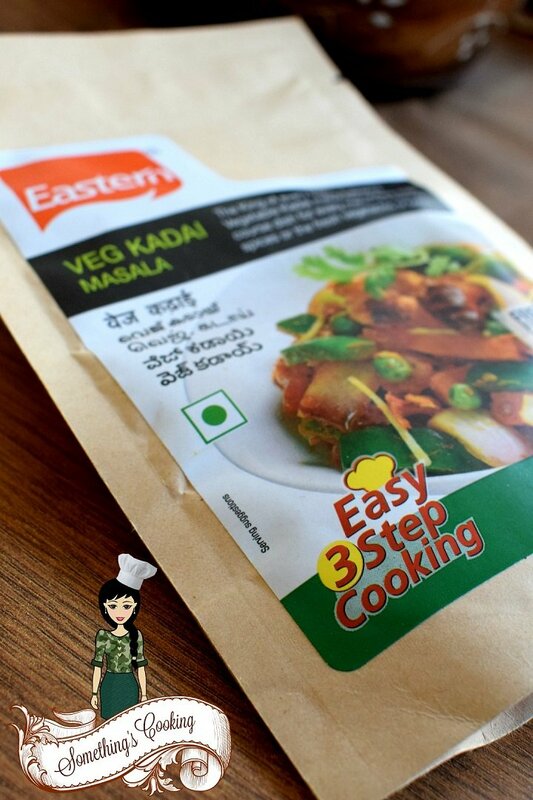 I use Eastern’s Fish Curry masala also for mallu authentic taste, much loved by the husband and kids. I have never tried these masalas but will check it out now. How much did you cook, Shalini? Wow! Pretty impressive.. I have never tried Eastern spices but now I will. I love making sambhar and this brahmin masals looks interesting.